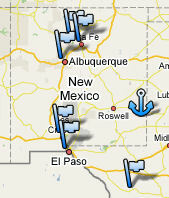 Division West has players from New Mexico (Albuquerque, Santa Fe, Los Alamos, and Las Cruces) as well as El Paso, Texas. Join forces today by contacting us at the e-mail address below. We can arrange for a member in your area to make contact. Pick up a business card the next time you visit Game Gopher in Albuquerque. See the events page for a map and other details regarding our game days! Want to find a player near you or check out fine selection of game day venues? Click on the interactive Google map below!